I n an earlier blog post this year I shared information on an app for the IPhone and Android smartphones that provided auction market information on cattle. The app was called Cattle Talk Mobile and at the time there was not any California specific information. I mentioned that I contacted the app developer, Michael Whitt, and suggested that the Shasta Livestock Auction could be added so Northern California ranchers would benefit. 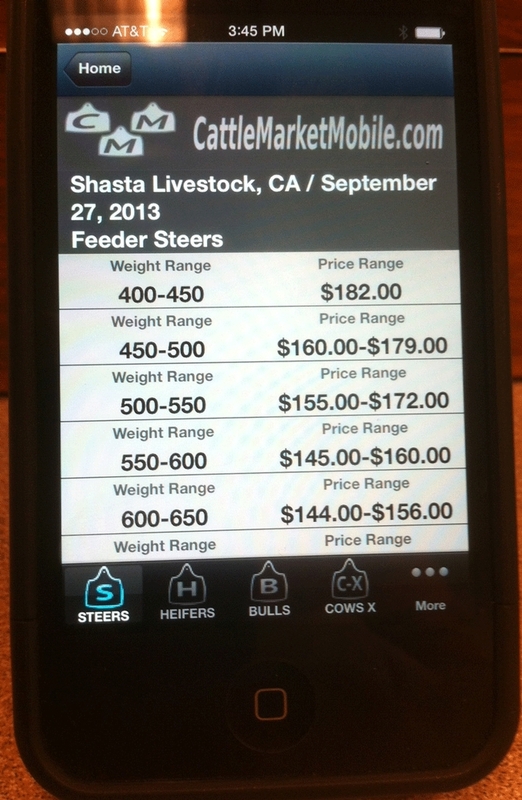 Today I received an email from Michael that the Shasta Livestock information is now part of the app. He also mentioned that the name has been changed to Cattle Market Mobile. More information is available on his web site CattleMarketMobile.com. The app is also available through the ITunes app store for the IPhone and through GooglePlay for the Android. Nice app. Thanks for getting Shasta added!